Hakushu 12yo (43.0%): Hakushu distillery is founded in 1973 at the foot of Mount Kaikomagatake next to Ojira river tucked in the woods. It is one of the most stunning looking distilleries in the world situated in dense forest with its unique bridged padogas. In spite of its relatively young age the distillery went through several major changes and modifications since then. Today it has a production capacity of 4 million liter of single malt alcohol per year using its eight pairs of pot stills. There is also a grain whisky distillery at the site producing grain alcohol for several Suntory blends. 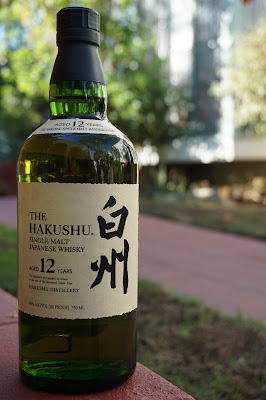 Besides this 12 year expression I will be tasting today Hakushu line-up carries an NAS, a 18 and a 25 year bottling as well. Color: Straw, oaked Chardonnay with nice slow legs. Nose: Green hay, malting floors, fresh spearmint leaves and bitter lemon. Sliced Bartlett pears, poached apples and strawberries. Sea breeze, vanilla and sweet eucalyptus drops with slowly building smoke like coming from an extinguished campfire at the background. Palate: Lemonade, dry wood and sweetened iced green tea. White pepper, yellow grapefruit and lime peel. Hint of nutmeg, peat and sage. Fireplace smoke, freshly milled grist, green grass and fresh tobacco leaves. Finish: Medium long with white pepper, smoke and sweet soot.